Lots of new things awaited me in Seattle when I moved. Among them, actual changing Seasons. I moved in the summer…when the days are long offering light till 9:30 or later at night, the temperatures were warm. It was a lot like what I left behind in San Diego honestly, and I thought Summer would remain my favorite season of all. Then, by October, the leaves on many trees around town changed from green to vibrant reds and oranges. It was breathtaking…and my first time witnessing an actual Fall. I thought my new favorite season would surely be this, not summer anymore. Then, by December, all the beautiful leaves were gone leaving spooky stick trees behind. Daylight, if you could call it that with all the grey clouds and fog and rain, was short with it being dark by about 4 in the afternoon. Low temperatures were about 30ish (mild, I know now, but not at first for a California girl! ), with the highs only into the 40s maybe. This was Winter, and it was cold, and wet, and absolutely not going to become my new favorite season. I clung to Fall. But then, sometime around early Marchish, the cherry blossoms start blooming. First there’s just a little pink here and there, and little by little as the days pass…the beautiful amazingly pink cherry blossoms are everywhere. Spring. A signal of new life, new beginnings, vibrant proof we had survived Winter which was now in our tail lights. Spring. My new, forever, favorite season of the year. This year, February, still buried in grief and sadness having just lost my Mother, I searched for any sign that I would ever smile again, feel anything close to normal life again. I started walking, taking drives, anything to distract myself from sadness. We were blessed with unseasonably warm weather and frequent sun for the first part of the year…which played a trick on the plants, trees and even birds in the area. 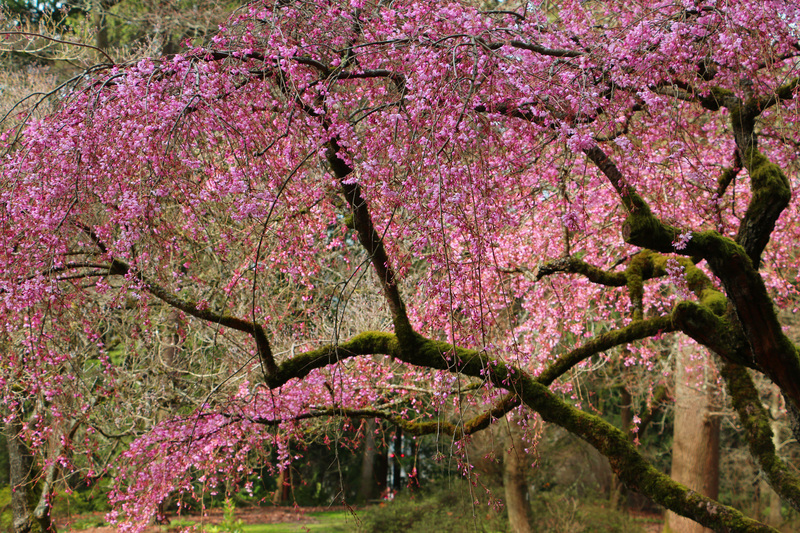 Robins started singing in February, daffodils started raising their little heads everywhere, and the cherry blossoms started filling our neighborhoods with more and more pink every day. I walked, I drove, looked at the cherry blossoms and smiled. I had not only survived another Winter, I had survived a heartbreaking loss. And this was my first real sign that I would be ok. I would never be the same, but I would be ok. And I would smile. I was smiling. Every time I look at those pink pink trees…I smile. And so the name for my new blog, new life, was born: cherryblossomsmiles. All one word. I love it. This entry was posted in Uncategorized and tagged cherry blossoms, death of mother, death of parent, new beginnings, seasons, seattle. Bookmark the permalink.